For your next picnic, try something new with watermelon, said Tejal Rao in The New York Times. 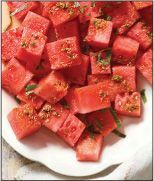 Malika Ameen, a Pakistani-American cookbook author, makes flavor-packed savory fruit salads all summer, tossing melon, berries, or stone fruit with citrus juice, jalape.o, and a mix of spices including toasted cumin and amchur powder, made from dried green mangoes. The salad should sit before it’s served, but it comes together quickly.